How can I dress up chairs for ceremony without chair covers? (Closed) How can I dress up chairs for ceremony without chair covers? Any ideas? My fiancee and I are trying to save money by cutting back on the extras, such as chair covers. We are renting white wooden folding chairs for our beach ceremony. I would welcome any ideas you have to inexpensively decorate the chairs. Thanks so much! I am doing some really inexpensive chair sashes. are you having programs? you could put a sea shell on the program on each seat. Or just a flower. We got married a few months ago, honestly, no one will notice if the chairs are decorated of not. Or decorate fans with your programs, and either place them on eac seat or hang them from the seats! I also agree with TallBride — it’s such a minor detail! Good luck, though, with your decision! Chair sashes are a great option. 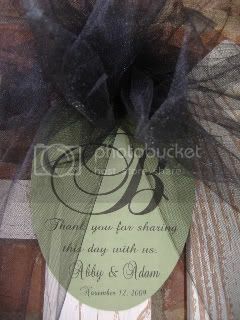 Or some sort of idea using ribbon/organza. save-on-crafts.com has some options! Put the programs in the seats, and don’t worry about decorating the chairs, they’ll be fine. Just make the aisle pretty with some tule and petals! I agree, white folding chairs look pretty nice. Use a sea shell or a fan program. along the aisle use torches, or flowers to decorate. I second what others have said, white wooden chairs are pretty &amp; don’t really need decoration, you could add pomanders having from the chairs. Or….and I can’t find the picture…. but a bride that had a beach wedding lined the isle with tall square vases that were each filled with sand and then put a tall white candle inside each one, it was SO&nbsp;BEAUTIFUL!! As an update, I must say that I was misinformed. The rental company does not have wooden chairs. They just have ivory plastic folding chairs with a chrome body. Sigh. You can’t hang anything from them because there is nothing to hang anything from. You could get some inexpensive shepherd’s hooks, and hang some flowers along the aisle. Or, use ribbon and/or flowers to dress the first chair in from the aisle, every few chairs of so. i’m doing tulle sashes and it really fancies things up. plus we found fabric for less than $1/yard so very economical! Check out theknot.com they have tons of pictures of chair decor options. I have found so many unique ideas from the site. Here is a picture of a Chairbow with a monogram tag. This couple chose to use it to thank their guests. The topic ‘How can I dress up chairs for ceremony without chair covers?’ is closed to new replies.